Spot colors, also called custom colors, are premixed inks that are used instead of, or in addition to, the cyan, magenta, yellow, and black process-color inks. Each spot color requires its own color separation or printing plate. Graphic designers use spot colors to specify colors that would be difficult or impossible to achieve by combining the four process inks. You'll now add spot color to the image in this lesson by creating a spot-color channel. 1 In the Channels palette menu, choose New Spot Channel. 2 In the New Spot Channel dialog box, click the color box, and select Custom in the color picker. 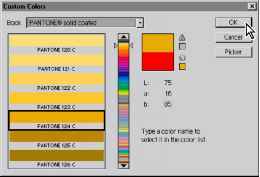 3 In the Custom Colors dialog box, type 124 for the Pantone® custom color 124. (Because there is no text box for the number, you must type it quickly.) Then click OK.
4 In the New Spot Channel dialog box, enter 100% for Solidity. The solidity setting lets you simulate on screen the ink solidity of the printed spot color. Inks range from transparent (0% solidity) to opaque (100% solidity). The Solidity option affects the on-screen preview only and has no effect on the printed output. 5 Click OK to create the spot-color channel. A new spot-color channel named PANTONE 124 C is added to the Channels palette. • For spot-color graphics that have crisp edges and knock out the underlying image, consider creating the additional artwork in a page-layout or illustration application. • To apply spot color as a tint throughout an image, convert the image to Duotone mode and apply the spot color to one of the duotone plates. You can use up to four spot colors, one per plate. • The names of the spot colors print on the separations. • Spot colors are overprinted on top of the fully composited image. 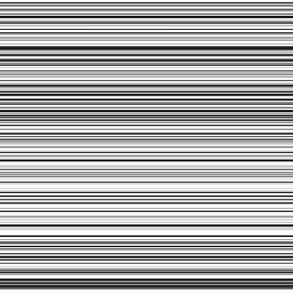 Each spot color is overprinted in the order in which it appears in the Channels palette. • You cannot move spot colors above a default channel in the Channels palette, except in Multichannel mode. • Spot colors can't be applied to individual layers. • Printing an image with a spot-color channel to a composite color printer will print the spot colors at an opacity indicated by the solidity setting. • You can merge spot-color channels with color channels, splitting the spot color into its color-channel components.